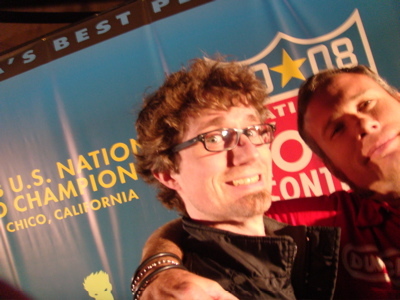 I spent this last weekend in Chico California at the National Yo-yo Contest, and it was a lot of fun. The official Duncan Crew photo for Nationals 2008. No one else was around but Mark McBride and me. The trip out was more than a little brutal. First of all, any voyage with three different flights is going to be difficult. If you do take a trip with that many flights, I recommend that you don’t eat a bad sandwich in Las Vegas and then throw it back up on your next flight like I did. Not fun at all. It is very hard to puke on a plane and not get any on yourself. I still had another flight to go too. Once that horrific ordeal was over, the rest of the weekend went really well. Whenever I go to a yo-yo contest or a juggling convention I usually have a goal in mind. For this contest I wasn’t really sure what my goal was until I looked at what I had packed. The most normal thing for people to bring to contests is a fairly big case full of yo-yos, and for some people, a few tops as well. I was trying to travel light to avoid the airline baggage fees, and I realized that I had packed a mere 4 yo-yos but I was bringing 8 tops. During the course of the weekend, two of the yo-yos never even made it out of my bag. I guess I’ve got tops on the brain. I spent most of my time hanging out with my top-spinning friends. It was awesome. Alan Gray, Eric Wolff, Jon Gates, Jorge, Hans, Catherine and I had our own little posse of spin. We shared some tricks, and had a good battletop contest. 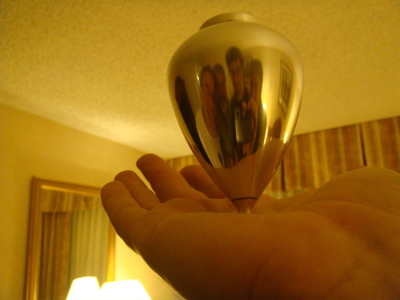 Alan, Eric, Me, Hans reflected in the spinning Silver Surfer top (a highly polished Quicksilver). One thing I always forget about Nationals is how short it is. I got out to Chico on Thursday night, watched the Vice Presidential debate, and then hung out with the few others who were there. Friday it rained, so the prelims were moved to Saturday. The result for me was that the contest felt even shorter than normal. Since almost everyone goes home Sunday morning, the contest really felt like one day this year. It’s a lot of effort and money to get there for just one day. There were some delays on my flights home, and I had to literally sprint through the Denver airport (at altitude, ug) after they called my name on the intercom. It took over 30 minutes to recover and stop coughing, but I made my flight. In the San Francisco airport there was an awesome exhibit about the space race and its effect on popular culture from the 30s through the 60s. They had toy robots and space guns and flying saucers and lunch boxes and all kinds of incredibly cool stuff. It was one of the highlights of the trip. All in all it was a good weekend. I just wish Chico weren’t so far away from Pittsburgh. Sounds like you had a fun trip between here and the topspinning forum. That new Duncan sounds neat too. Love the pic! Strangely, I’ve seen neat stuff like that in airports too, the Atlanta airport has a huge collection of music memoribilia. Mark Hayward Is My Hero is powered by	WordPress 5.1.1 and delivered to you in 0.283 seconds using 38 queries.